Anderson Silva's career may have ended in gruesome fashion at UFC 168. It has not been easy on the eyes to watch the greatest of alltime in mixed martial arts end their careers of late. Instead of riding off into the sunset, it’s more like being carted off to the hospital — with the fighters routinely referred to as the best ever, but with an undertone of pity. For example, with all the amazing things Royce Gracie accomplished in the early days of the UFC, it’s hard to shake the lasting image of Matt Hughes pounding him into the mat when he decided to make a comeback in 2006 after his best days were already behind him. Fedor Emelianenko technically retired off of a few wins in promotions that most fans couldn’t identify, much less find on an American television network. Prior to that, however, the memory most have of Emelianenko at the end of his career is laying face down after getting whacked by a series of Dan Henderson punches, and that’s one fight after he was trapped under the immense power and girth of Antonio ‘Bigfoot’ Silva dropping canned hams on his head for an entire round prior to the bout being stopped. On Saturday night at UFC 168 the fighter most universally recognized as the best ever inside a cage or ring may have seen the end of his career come courtesy of one of the most gruesome injuries ever witnessed on live television. Anderson Silva was down a round early in the rematch against the first fighter to beat him in seven years, but he came out confident in round two looking to rattle undefeated champion Chris Weidman using the best weapons at his disposal. In the first contest, Weidman’s coaches warned him to be on the lookout for Silva’s leg kicks, and it’s likely they were on guard for the same thing in the rematch as well. Silva cracked off a few of them before launching a right low kick that Weidman wisely blocked by raising his own leg off the ground just enough to meet his opponent’s shin with his knee. What happened next was visually debilitating on the eyes as Silva’s leg snapped, and wrapped like a rubber band around Weidman’s leg. As Silva stepped backwards he crumbled to the mat in obvious pain, his leg shattered and his hopes of regaining the UFC middleweight championship seemed like the least of his worries at that moment. Seeing a fighter so respected and honored as a champion, laying on the ground, writhing in pain was almost too much to witness. Replays sent a shiver up the spine of anyone in attendance and every person watching at home. The slow-motion video only amplified the true horror that Silva must have felt as he connected with the kick, then fell to the ground in complete and utter agony. Reporters at the event said that as Silva was carried off on a stretcher he was screaming in pain as he was being taken to the back for medical attention. It’s certainly not the way anyone wants to remember Anderson Silva’s amazing career, but no matter how much we will try to deny it that’s the image we will be haunted by for years to come. I’m a big fan and I have been since he came here. It’s just one of those crazy things. In a million years you don’t expect to see that. "I’m a big fan and I have been since he came here. It’s just one of those crazy things. In a million years you don’t expect to see that," UFC president Dana White said about Silva after the event. "This will be a tough thing to over come and come back at his age. He literally left here and is going straight into surgery. Doc Saunders, who is here tonight watching the fights, is following them and he’s going to do the surgery, probably in the next hour I guess." At 38 years of age and with probably at least a year before he could even contemplate training to fight again, the last chapter of Anderson Silva’s incredible career may have come to a close on Saturday night with his leg being broken in half. It’s been a sad path MMA fans have had to watch as the competitors universally recognized as the icons of our sport have all suffered a lonely exit and a fall from grace. It’s easy to say that Silva’s legacy won’t be tarnished by what transpired at UFC 168 — the end of his fight happened because of injury and not an actual finish like a knockout, submission or even a judges’ decision. Still the last two moments that will be replayed over and over again are the knockout to Weidman and now the leg break heard round the world. It’s no different than how Emelianenko’s incredible 28-fight unbeaten streak is still marred by the three straight losses that precipitated the end of his career in major promotions. There’s no certainty that Silva couldn’t somehow formulate a comeback, but if this is Las Vegas the odds are against him ever returning to the Octagon. The fact is no one could have even contemplated that the last moment of Silva’s historic career would be him carried out, strapped to a stretcher, eyes shut and tears running down his cheeks. "I didn’t want to see Anderson Silva get hurt like that," Weidman said after the victory. Maybe the saddest part about this entire ordeal for Silva is that he’s been talking about retirement for a few years now. It first happened a few years ago when he was approaching his 35th birthday, and then again as he headed into the rematch with Weidman. The fact that Silva may not get to make a choice to walk away from the sport he loved for so many years is the real shame in everything that happened on Saturday night. UFC president Dana White may have summed it up the best when speaking about Silva during the press conference. There’s little argument about Silva’s accomplishments or standing in regards to historical context to this sport. 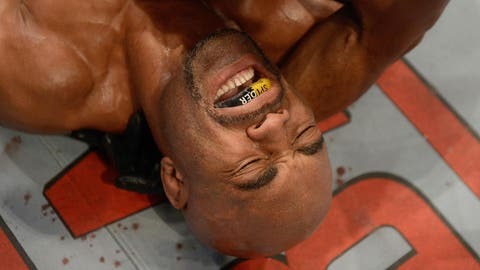 But how it all ended on Saturday is a nightmarish vision to the charmed dream life Anderson Silva once led. "Anderson Silva’s been amazing. He’s one of the greatest of all time if not the best ever," White said. "It’s a sh***y way to see him go out, but it’s part of the game."